Can your cycling club ask a favour? Velocity Cycling Club will continue its 35+ years of serving Edmonton’s Cycling community. Lending your volunteer’s hand to hosting our Race the Clock Individual Time Trial on Sunday, June 24, 2018. Every volunteer that lends a hand, in any small way, will help make this a memorable race day experience for all participants. 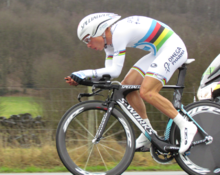 And we expect many new and seasoned time trialists to take their best shot against the clock. For some, this will be their very first race day. Let’s make it a memorable one with no shortage of volunteers! Please consider signing up for a volunteer position. Just click this link to make your selection. Thank you for continuing to be a key supporter of Velocity’s long-time Cycling traditions! P.S. You can read all about the Race Day Details right here, on the event webpage. Then be sure to Sign Up as a Volunteer.